What Do You Do When You Don't Feel Like Doing Anything? I admit it. I'm getting older, and every year I notice that I can't do as much as I used to. A few days ago I had a fall that 10 years ago I would have completely forgotten. Now, my body won't let me forget. What should have resulted in nothing more than a bruised ego, has left me with a very sore knee and a dilemma. Do I nurse this puppy and sit here like a lump on a log? Or do I continue doing what I want to do, regardless? In the past I would have just kept on chugging along, but now I know if I don't take care of myself it will take much longer to get better. So, I'm sitting here with an ice pack on my knee, hyped up on Motrin, with absolutely no desire to do anything productive. What's the point? I can't do what I need to do. No going down to the garage and bringing up boxes to be put away, no climbing ladders to hang pictures, even doing the laundry is a struggle. Once again I'm reminded of how much I take for granted. I'm one of those people who loves a lot of variety in what I do. I find it difficult to do even the things I love the most, (like quilting), other than in spurts. I've also learned enough to know that forcing creativity gives up terrible results, so I try not to do that. If I'm not in the mood, I'm not in the mood. Today should be an ideal quilting day. I should be nestled in my comfy chair with a pup on either side of me and my cat at my feet, cozily sewing away....ahhhhhhh, what a lovely picture! Instead I'm cranky and bored, and am finding it difficult to get excited about anything. I've always been good at keeping myself occupied, but when I get bored it gets bad, real bad. Oh well, tomorrow is another day, and who knows I may be able to walk without saying things I wouldn't want my mother to hear. In January of 2011, I wrote a post about my excitement over receiving a bundle of fat quarters of what was then a new fabric line by Laurie Wisbrun called "Tufted Tweets." I loved this fabric and after way too long I finally pieced a quilt top from it. At the time I had all kinds of plans for it, but hadn't really figured out what to do with it. This is how it looked in the Spring of 2011, and 2012, 2013, 2014, 2015, 2016, 2017, until finally I pulled it out and started working on it again. I'm admitting to taking 7 years to nearly finish a piece because I wanted to bring hope to all of you sitting on WIPs (works in progress). They can be finished! Well, nearly so. I'm just finishing up the green sofa piece on the bottom right. I'm also doing what I always end up doing, adding more embellishments throughout the piece to balance the detail. As you can see I've been busy for the last few months! This isn't the best quality photo but I'll try to get some better ones tomorrow so you can see the detail. I started working on this again because while we were looking for our new home we were living in a small apartment. I didn't have many materials to work with, but when I found this unfinished quilt I thought it might be a good way to keep myself occupied during the rainy Oregon winter. It worked! Along with keeping me well occupied it also got me back into my creative groove, and I was loving getting back into creating the art I love so much. I also had fun visiting the local quilt shops and fabric stores looking for embellishments and new fabrics. It had been a long time since I'd bought anything new. I was also challenged by the fact that this quilt top was seven years old. How could I make it more up-to-date? Adding new fabrics really helped. It also helped that I learned years ago to only buy fabrics I absolutely love. Fortunately, I still loved them! I will be posting more before and after photos in the next few days and maybe even a few tutorials on the embellishment I've done, (and am still doing!). This project has really inspired me to pull out a few other finished quilt tops and have some fun! I have to admit that the cutting and piecing is the part of the process I like least, so starting off with a finished top makes it possible for me to jump right into the fun stuff. In the past I've been inspired to create something, but by the time I got the top finished, the thrill was gone. Now the thrill is back! I hope this will inspire you to pull something out of your past and have some fun with it! I warned you....the crankiness continues! I attended a local quilt show in May. I will admit that I haven't been to one in a few years, the last was one of those shows where it was all about selling stuff and not so much about quilts on display. Now, I like to buy fabric as much as the next person, maybe more, do you remember my stash? And this was taken in September of 2015, and doesn't include several large tubs, and three more smaller bookcases.....I definitely have fabric stash cred! The show I went to a few years ago was full of fabric vendors who thought it was so marvelous to offer their fabrics in only one or two yard pieces. Whatever happened to fat quarters? Not to mention that so many of the fabrics were ones I'd seen online for sale on fabric websites. I ended up buying nothing, and the quilts on display looked like the same ones I'd seen the last time I went to that particular show, (and shame on me for going again!). The quilts display were very good, and I loved that they showed quilts from less accomplished quilters as well. I love to see the best professional and amateur quilting, but I also enjoy seeing the joy in the quilts of those who are just starting out. They also had a collection of quilts dedicated to veterans, and were having a ceremony honoring them. It was so great to see so many of the show guests stopping to show respect for the soldiers. It's been a peeve of mine for a while that so many of the quilters of today do all of their work by machine. I know it's not easy to do, I'm not dissing their ability, but I love to see something that has been hand-stitched, and therefore less than perfect. Some of the quilts were absolutely gorgeous, but I kept thinking, how would they look with some hand-stitching? Is there no room for us hand-stitchers anymore? I no longer compete in the quilting world because I feel that little ol' me with my needle and thread can't compete with a $10,000 machine run by a highly skilled operator. I just can't, and the fact is that I really don't want to. What's most frustrating from my point of view is that for many years I was the renegade quilter. The one that thought it was OK to mix cottons and other fabrics, who didn't freak out if something was off grain, and who wasn't overly concerned that my stitches weren't 10 to an inch. In the early days there were a lot of hardliners and I encountered them at quilt shows. 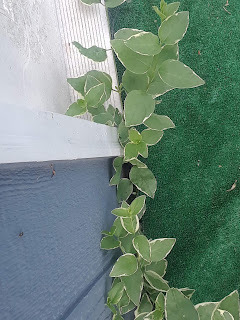 I think they were afraid that their comfort zone was being threatened and us "darned art quilters" were going to take over and then they were going to be on the outside looking in. I don't remember ever mocking traditional quilters, even while I was purposely stretching the limits. I always appreciated their skill and their commitment. Let's face it, if those dear ladies hadn't stuck it out as long as they did to teach a new generation, who knows what would have happened to quilting. It could have ended up like macrame. I remember being very frustrated that my skills weren't up to par. My mother was often critical of my technique and told me that I needed to improve my skill set. She was right and I was very fortunate that she didn't reflexively praise me, but instead encouraged and inspired me. I was also fortunate in having a wonderful sewing instructor, LaVina Scott at San Joaquin Delta College. She had worked in the fashion business in San Francisco for years and knew how to make everything from shoes to hats. She taught me technique and I leaned how to do things the "right" way. It was a wonderful gift to be expected to be the best, but the most important thing she did is that she gave me the wings....and then let me fly. I'll never forget what she said on the last day of our class, she said, "OK Ladies, now you know the rules, go out and break them!" And so I did! As often as possible and not always with the best results. However, through it all I always maintained my admiration for those fine hand quilters out there and their beautiful work. In the beginning of my quilting journey I was all for machine quilting. I was young and in a hurry. Today I've come full circle to the point where I do very few things by machine, and always quilt by hand. Now I'm one of those who question the validity of machine quilted quilts. It's not that I don't like them or that I don't think they're "quilts" I just question judging them side by side with hand quilted work. 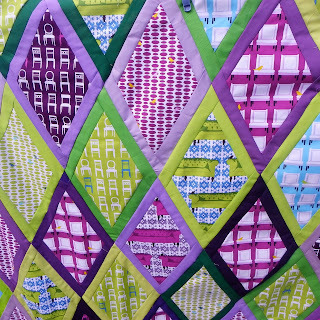 I know that quilting by machine is difficult, especially if you are hand guiding the machine, but does it rise to the same level of hand quilting? I'm not sure yet, but I do know that it bugs me when an entirely machine made quilt wins first prize at a big show. I just think the machine quilters have an advantage, and a lot of that is financial. Those who can't afford the expensive quilting machines are left out of the mix, and I think that's a crime. I look back to my early days when if I had 10 bucks to spend on fabric that was a lot. I wonder how many young quilters are discouraged when they find out how much a decent machine costs? Are we helping or hurting the next generation of quilters by emphasizing a style of work not affordable to everyone? Isn't it interesting that some of the same struggles that existed within the quilting community in the 1970s are still with us? 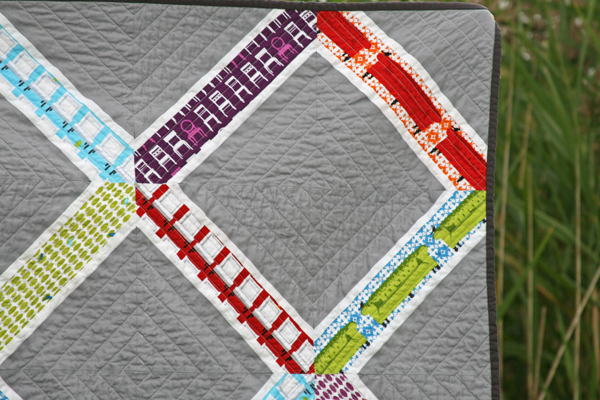 Will there always be this pull between traditional and non-traditional quilters? I think it's eased a bit on the traditional end. Different fabrics and color combinations are more widely accepted, and the ease with which machine quilting is accepted is a new thing too. I wonder what things will look like 20, even 10 years from now? It's sad for me to see that after 5 years, hand-quilting seems to have taken even more of a backseat. I guess I'm just the old lady in the corner, pricking my finger and saying a ladylike swear word, while I'm still happily stitching away with my #10 needle and bright colored thread. Sometimes it's kind of fun to slow down and enjoy the moment, and the imperfections of life. Maybe that's because I'm slow and imperfect. So be it! It's hard to believe that the original incarnation of "the cranky quilter" began in 2009. I had been laid off from my job and was running my own little graphic design business. With way too much time on my hands, I started this blog and two others. 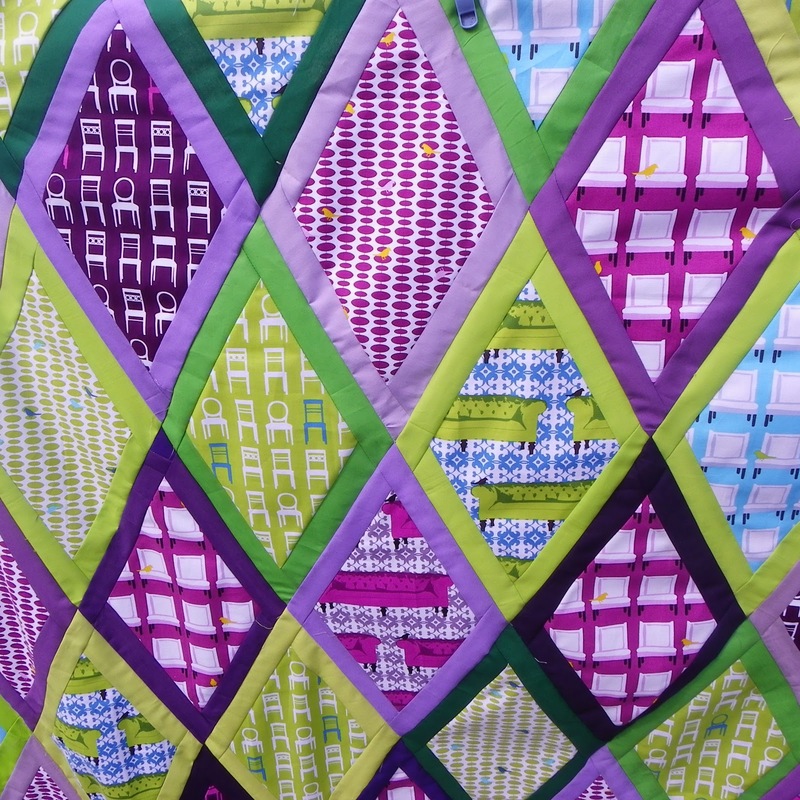 I really enjoyed sharing my experiences and love/hate relationship with quilting and the quilting world, and others seemed to enjoy it as well. My followers were growing, and I made it into Quilter's Home magazine's list of top 50 quilting blogs. I was riding high! Then, as it usually does, life started throwing pebbles at me, then rocks, then boulders, and finally grenades. It was getting more and more difficult for me to commit to blogging on a daily basis, or a weekly one, and eventually it became years. I missed it, but then I had more important things to deal with so something had to go. Unfortunately, it was my blogging life. I could describe to you the last ten years of my life, but I don't want to whine because I know there are so many people out there who have had much worse times than me. The worst was that I lost my father to Alzheimer's in 2014. and my older brother to a massive heart attack in 2017. The thing that helped me through all of this was my creative spark. It was how I coped with Dad's death. I offered to create a video for the service and sat in front of my computer for days going through pictures, picking out songs, and crying my eyes out. My family thought I was remarkably calm, but they didn't know how much I sobbed, and how my heart broke while I was creating that video. I'm so glad I did it as it's now a comfort but at the time, if it wasn't that I felt Dad in the room with me, I don't think I could have gotten through it. Selecting just the right photo, the right music, and timing everything just right soothed me. Once again, making something helped me cope. It's that spark within us that makes us who we are and what we miss the most about the people we love who have passed on. I realize now, more than ever, that doing what you love as much as you can is the only way to squeeze the most out of your life. It's important for the soul. My last post was almost 3 years ago. I've tried to start up again multiple times, but something always happened that made it difficult, and at times impossible. A year ago my husband got a job in another state and we had to move. Two months ago we finally moved into our new house and things are settling down so I can blog again. I think it's about time! And, thank goodness that whoever took my domain name after I let it lapse, gave it up just in time for me to get it back....so, the cranky quilter returns! I've tucked away all of the old posts, but if there is one you really want to see, let me know and I'll publish it again. I'm planning on revisiting many of those posts, and showing you what actually ended up happening to some of those projects I showed you. 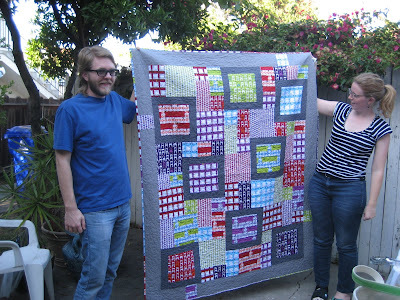 Fortunately for me, I didn't stop quilting when I stopped blogging. 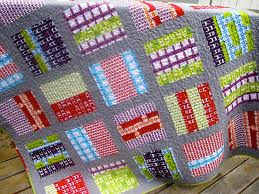 I still love it as much as ever, although my perspectives have changed a lot, as has the whole quilting world. Lots to discuss and whine about, the crankiness will never die! Tweet it, Tweet it Good! 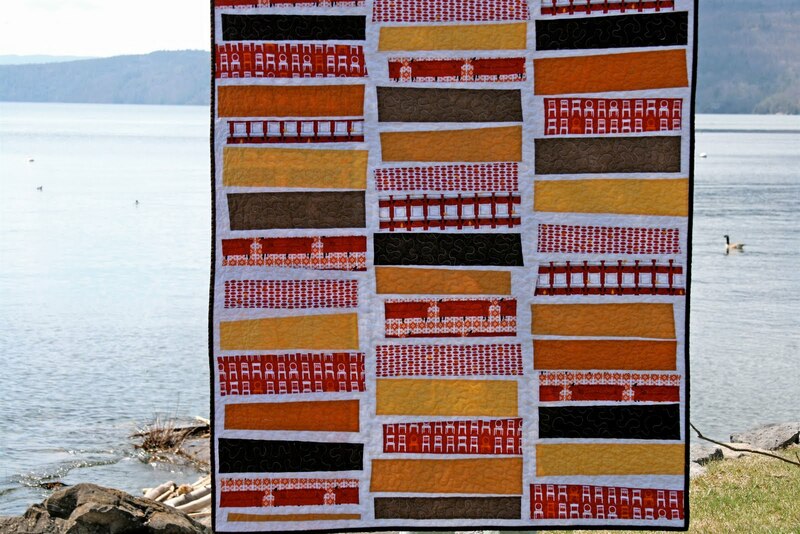 Last June "Tufted Tweets" by Laurie Wisbrun was my fabric of the month. I wrote a couple of posts about it because I absolutely loved it! 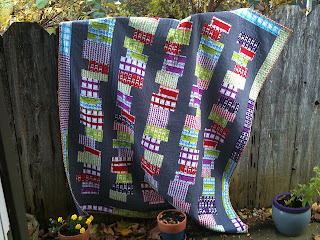 I had all kinds of plans of what I was going to do with it when I got the fat quarter set, but had done nothing until I got shamed into it over at www.fraidycatquilters.com/. 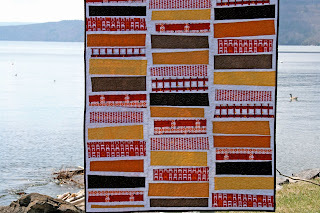 This morning I had the brilliant idea of doing a search on Google Images to see if I could find examples of what other quilters have done with this line. I usually don't look in advance because I like to keep my designs original. but if you're uncomfortable designing for yourself, this is a great way to get ideas. There are so many talented quilters out there, doing unique and fun things. It's great to be able to see what they're up to, and so easily....gotta love that internet! Here are some samples of what I found along with the links to their blogs and/or websites. There's a whole lot of inspiration out there! Beth used a wonky coins pattern paired with a solid. Hannah made a pillow in a log cabin design. This would also make a great quilt. sequinK's pattern is deceptively simple. Look at the different configurations of each square. Jeri's combos of different squares make for an interesting quilt. Notice how the solid bordered squares stand out. This is from Laurie Wisbrun's blog. Very modern take on a bar quilt. Great stuff from Ashley at filminthefridge.com. 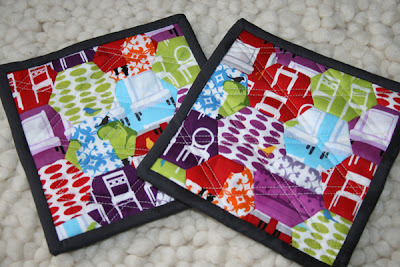 Gotta love these potholders! I'm starting to see the possibilities in hexagons. More great stuff from Ashley, a simple design, well executed. Now, I'm really inspired to finish piecing! Hope you got some great ideas as well. II'm a writer, quilter, and graphic designer who struggles with integrating my creative side into my everyday life.